Combiwalls are particularly used in deep excavation and heavy marine environments in which extensive strength and longevity are key components. The possibility to use different combinations in combined walls allows them to take loads that cannot be taken by conventional sheet piles. The sheet piles are usually shorter, varying from 60% to 100% of the length of the king pile. The double sheet piles alternate throughout the wall to form the water-tight seal and continuous wall. This type of system can be used in any soil conditions and has a high level of re-use. It is suitable for both permanent and temporary use. Combined walls system are a combination of sheet piling and steel pipes or King piles to achieve a bigger moment where single sheet piles can not bear the loads. Combiwalls are particularly used in deep excavation and heavy marine environments in which extensive strength and longevity are key components. The possibility to use different combinations in combined walls allows them to take loads that cannot be taken by conventional sheet piles. Due to the arching effect the king piles bear all the loads and intermediate sheet piles have only an earth-retaining and load-transfer function and they may be shorter than the king piles. Combi-wall system has bigger than 40,000 cm³/m. Combined sheet pile walls can be classified as tubular combined walls and HZM/HZ combiwall. They are made of three component:king piles(steel pipes or H beams),intermediary sheet piling,and interlocks.The king piles will carry most of the load,including substantial vertical loads in addition to the normal bending loads. The sheet piles are usually shorter, varying from 60% to 100% of the length of the king pile. The double sheet piles alternate throughout the wall to form the water-tight seal and continuous wall. This type of system can be used in any soil conditions and has a high level of re-use. It is suitable for both permanent and temporary use.The corner piles are normally a C 6,C9,or E21,E22 connections. 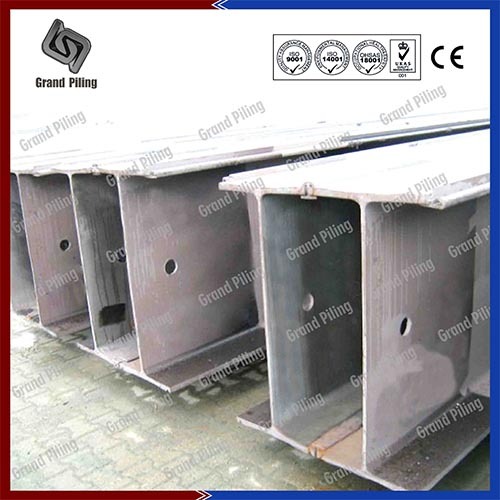 The king piles are steel pipes,normally are spiral welded steel pipes do to big diameter and big length requirements. We can produce both hot rolled and cold rolled interlocks for steel pipes. We can weld at our factory or clients can also choose to weld at job site. Tubular piles (King Piles) are ideal for use in the formation of a combi wall system.The tubular units feature an interlocking connector system to which double sheet piles are linked in order to form a continuous high inertia wall. As the King pile provides strength and stability. The HZM wall is a system incorporating HZM king piles as structural support and double AZ sheet piles as intermediate elements. The Projects organization produces combined piles by making the king piles at the right length and providing them with interlocks. All necessary welding can be done by our team. 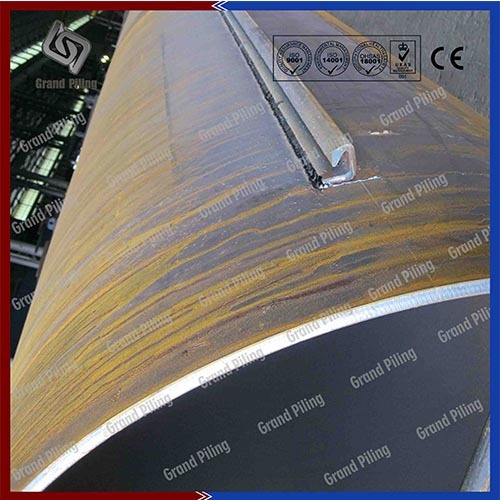 For hot rolled king piles,we will use RZD16, RZU16, RH16, RZD18, RZU18, RH20 connectors. For welded king piles, we have cold rolled connects to weld on. The intermediate sheet piles have only an earth-retaining and load-transfer function and therefore may be shorter than the HZM primary piles.